Thanks to Matt Gordon (@atsqlspeed) for hosting this T-SQL Tuesday. I have previously highlighted this function in a webinar with Pragmatic Works as a Hidden Gem in SQL Server 2016. It was not announced with great fanfare, but once discovered, solves a very common problem. The STRING_SPLIT function will return a single column result set. The column name is “value”. The datatype will be NVARCHAR for strings that are NCHAR or NVARCHAR. VARCHAR is used for strings that are CHAR or VARCHAR types. As you can see in the example, the results returned a leading space which was in the original string. The following example trims leading and trailing spaces. Thanks again Matt for this opportunity to share an underrated, but really useful shiny new tool in SQL Server 2016. This is a reprint with some revisions of a series I originally published on LessThanDot. You can find the links to the original blogs on my Series page. In the final installment of my series on SQL window functions, we will explore using analytic functions. Analytic functions were introduced in SQL Server 2012 with the expansion of the OVER clause capabilities. Analytic functions fall in to two primary categories: values at a position and percentiles. Four of the functions, LAG, LEAD, FIRST_VALUE and LAST_VALUE find a row in the partition and returns the desired value from that row. CUME_DIST and PERCENT_RANK break the partition into percentiles and return a rank value for each row. PERCENTILE_CONT and PERCENTILE_DISC a value at the requested percentile in the function for each row. All of the functions and examples in this blog will only work with SQL Server 2012.
Who has not needed to use values from other rows in the current row for a report or other query? A prime example is needing to know what the last order value was to calculate growth or just show the difference in the results. This has never been easy in SQL Server until now. All of these functions require the use of the OVER clause and the ORDER BY clause. They all use the current row within the partition to find the row at the desired position. The LAG and LEAD functions allow you to specify the offset or how many rows to look forward or backward and they support a default value in cases where the value returned would be null. These functions do not support the use of ROWS or RANGE in the OVER clause. The FIRST_VALUE and LAST_VALUE allow you to further define the partition using ROWS or RANGE if desired. The following example illustrates all of the functions with various variations on the parameters and settings. If you really like subselects, you can also mix in some subselects and have a very creative SQL statement. The following statement uses LAG and a subselect to find the first value in a partition. I am showing this to illustrate some more of the capabilities of the function in case you have a solution that requires this level of complexity. As I wrap up my discussion on window functions, the percentile based functions were the functions I knew the least about. While I have already used the position value functions above, I have not yet needed to use the percentiles. So, that meant I had to work with them for a while so I could share their usage and have some samples for you to use. The key differences in the four function have to do with ranks and values. CUME_DIST and PERCENT_RANK return a ranking value while PERCENTILE_CONT and PERCENTILE_DISC return data values. CUME_DIST returns a value that is greater than zero and lest than or equal to one (>0 and <=1) and represents the percentage group that the value falls into based on the order specified. PERCENT_RANK returns a value between zero and one as well (>= 0 and <=1). However, in PERCENT_RANK the first group is always represented as 0 whereas in CUME_DIST it represents the percentage of the group. Both functions return the last percent group as 1. In both cases, as the ranking percentages move from lowest to highest, each group’s percent value includes all of the earlier values in the calculation as well. The following statement shows both of the functions using the default partition to determine the rankings of order amounts within our dataset. The last two functions, PERCENTILE_CONT and PERCENTILE_DISC, return the value at the percentile requested. PERCENTILE_CONT will return the true percentile value whether it exists in the data or not. For instance, if the percentile group has the values 10 and 20, it will return 15. If PERCENTILE_DISC, is applied to the same group it will return 10. It will return the smallest value in the percentile group, which in this case is 10. Both functions ignore NULL values and do not use the ORDER BY, ROWS, or RANGE clauses with the PARTITION BY clause. Instead, WITHIN GROUP is introduced which must contain a numeric data type and ORDER BY clause. Only one column can be specified here. Both functions need a percentile value which can be between 0.0 and 1.0. The following script illustrates a couple of variations. The first two functions return the median of the default partition. Then next two return the median value for each day. Finally, the last two functions return the low and high values within the partition. The values segmented by the date partition highlight the key difference between the two functions. I hope this series helps everyone understand the power and flexibility in the window functions made available in SQL Server 2012. If you happen to use Oracle, I know that many of these functions or there equivalent are also available in 11g and they also appear to be in 10g. I have to admit my first real production usage was with Oracle 11g but has since used them with SQL Server 2012. The expanded functionality in SQL Server 2012 is just one more reason to upgrade to the latest version. 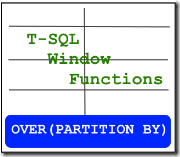 This is part 3 in my series on SQL window functions. In this post, we will explore using aggregation functions with T-SQL windows. SQL Server supports most of the aggregation functions such as SUM and AVG in this context with the exceptions of GROUPING and GROUPING_ID. However, prior to SQL Server 2012 only the PARTITION BY clause was supported which greatly limited the usability of aggregate window functions. When support for the ORDER BY clause was introduced in SQL Server 2012, more complex business problems such as running totals could be solved without the extensive use of cursors or nested select statement. In my experience, I used to try various ways to get around this limitation including pushing the data to .NET as it could solve this problem more efficiently. However, this was not always possible when working with reporting. Now that we are able to use SQL to solve the problem, more complex and low-performing solutions can be replaced with these window functions. SQL Server 2005 and the newer versions supports the usage of the PARTITION BY clause by itself. This allowed for some simple aggregate windows. The following example shows SUM and AVG for different partitions of data. The third function actually creates and average using a SUM and COUNT function. NOTE: The COUNT aggregate returns an integer value. In order to return the decimal, the values need to be explicitly converted to decimal types. Otherwise, the result was rounding to zero for all results in this sample. While it is possible to solve the same function using the subselects, the code is already getting messier and with data sets larger than what we have here, you would definitely see performance degradation. While I am digressing, I wanted to also highlight some details concerning GROUP BY. The one the biggest difficulties working with the GROUP BY clause and aggregates, every column must either be a part of the GROUP BY or have an aggregation associated with it. The window functions help solve this problem as well. In the following examples, the first query returns the sum of the amount by day. This is pretty standard logic when working with aggregated queries in SQL. However, if you wanted to see more details, but not include them in the aggregation, the following will not work. This SQL statement will return each row individually with the sum at the detail level. You can solve this using the subselect above which is not recommended or you can use a window function. As you can see here and in previous examples the OVER clause allows you to manage the grouping based on the context specified in relationship to the current row. One other twist on the GROUP BY clause. First, I need to give credit to Itzik Ben-Gan for calling this to my attention at one of our Minnesota SQL Server User Group meetings. In his usual fashion he was showing some T-SQL coolness and he showed an interesting error when using the OVER clause with the GROUP BY clause. The following will return an error because the first expression is an aggregate, but the second expression which is using the OVER clause is not. Also note that in this example the OVER clause is being evaluated for the entire set of data. The goal of the statement above was to show the customer’s total order amount with the overall order amount. The following statement resolves this issue because it is aggregating the aggregates. The window is now summing the aggregated amount which are grouped on the customer name. Thanks again to Itzik for bringing this problem and resolution to my attention. With the expansion of the OVER clause to include ORDER BY support with aggregates, window functions increased their value substantially. One of the key business problems this allowed us to solve was a running aggregate. The first example shows how to get a running total by CustomreName based on OrderDate and OrderID. This next example is more creative. It begins to show how powerful the window functions are. In this statement, we are going to return the annual running total aggregated by day. The differentiator here is that we use a DATEPART function in the OVER clause to achieve the desired results. The ORDER BY clause creates an expanding group within the partition. In the examples above, the partition was the customer. Within each partition, ordered groups based on OrderDate and OrderID are “created”. At each row, the OrderDate and OrderID groups are aggregated up to the current row’s group thus producing the running total. If more than one row has the same order grouping, all of the rows in the group are aggregated into the total as shown in the second example above with the days and years. The ROWS clause is used to further define the partition by specifying which physical rows to include based on their proximity to the current row. As noted in the first post in the series, ROWS requires the ORDER BY clause as this determines the orientation of the partition. The following example uses the FOLLOWING keywords to find the next two purchases that the customer made. As we noted in the first blog, the last two rows in the partition only contain partial values. For example, order 12 contains the sum of only one order, 14, and order 14 has now rows following it in the partition and returns NULL as a result. When working with the ROWS clause this must be taken into account. Lastly, adding the RANGE to the OVER clause allows you to create aggregates which go to the beginning or end of the partition. RANGE is commonly used with UNBOUNDED FOLLOWING which goes to the end of the partition and UNBOUNDED PRECEDING which goes to the beginning of the partition. One of the most common use would be to specify the rows from the beginning of the partition to the current row which allows for aggregations such as year to date. In the example below, we are calculating the average order size over time to the current row. This could be a very effective in a trending report. As you can see, the latest versions of OVER clause supports powerful yet simple aggregations which can help in a multitude of reporting and business solutions. Up next, the last blog in the series – Analytic Functions which are all new in SQL Server 2012.